Gamespot - 8/10 - Deus Ex: Mankind Divided refines and reinforces the defining foundations of the series. It creates challenging situations and gives players the tools and flexibility to deal with them in a multitude of ways, all within an absorbing cyberpunk world. 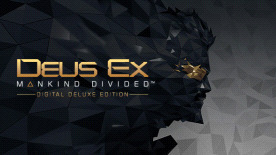 IGN - 9.2/10 - Mankind Divided’s gorgeously realized version of Prague is deeply infused with meaty, multi-part quests that give you plenty of chances to leverage its toy chest of cool gadgets and abilities. God is a Geek - 9/10 - Mankind Divided is a hugely playable adventure in a world that will stick with you every time you log off. Beautifully grim, relentless captivating, and humanly flawed, this dystopian vision is a compelling, tightly-crafted experience. Please note: this DLC includes some consumable items which will permanently disappear from your inventory once used (including ammo, darts, grenades, weapon parts, praxis packs and credits) and will not be available in subsequent play-throughs or other saved games.